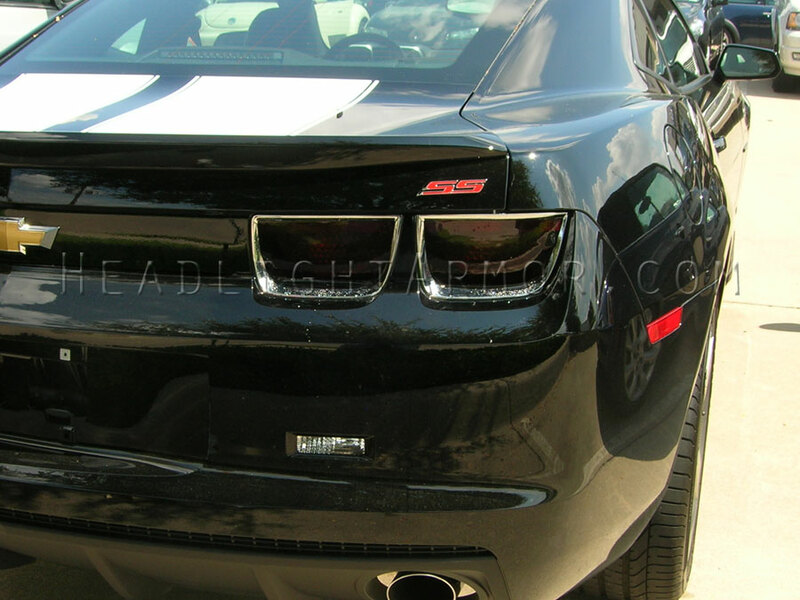 Smoking your taillights and adding color to your headlights is wildly popular these days and we would like to think we have helped that trend along by supplying a number of well know vendors servicing other makes. 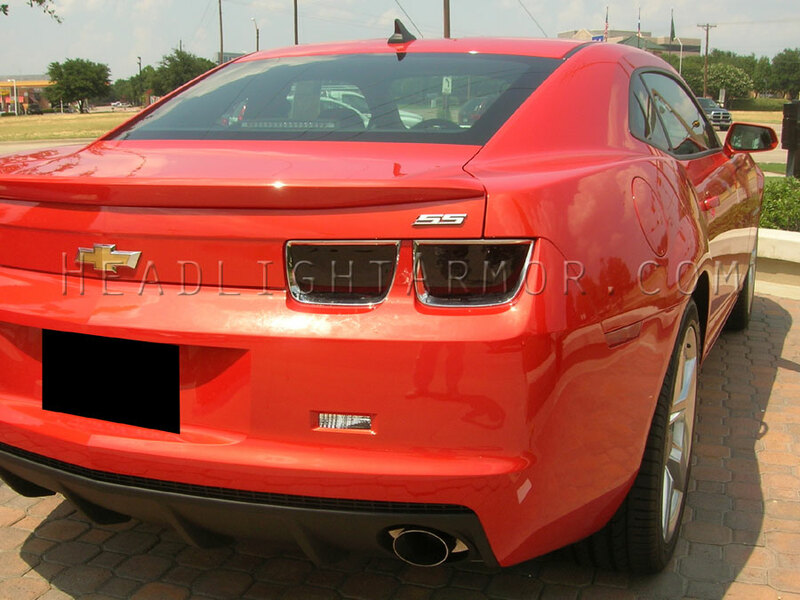 We will strive to directly provide the Camaro Community with the highest quality lighting kits, first-rate customer service and of course highly competitive prices! Consider the cost of replacing a damaged composite headlight these days - $hundreds of dollars EACH in most cases. Adding a layer of protection against the elements is a good idea - plus these are much easier to maintain than old fashioned clip on covers, which are just as susceptible to pitting as your headlights and susceptible to theft. While other companies may use thinner 2-3mil sign vinyl (know as overlays), 8-15mil paint protection film, or older thicker versions of 40-120mil vinyl we have found that our 20mil (.51mm) films offer the best combination of protection, ease of install, along with long term performance. We use a tough high performance vinyl that is designed to protect the lens first and foremost. Our lighting protection kits are manufactured from a 20mil (.51mm) thick material for maximum protection and a long service life. For those of you with a clear bra, these are 3X thicker on average. Granted we are not talking about magic deflector shields and if you hit something big enough, going fast enough you run the risk of putting a hole in your headlight – no matter what you have covering it! The application is pretty straightforward – we have some DIY Install tutorials on our site here. We have a full night Headlight Protection kit test session here. We also have a wide variety of installed photos in our various galleries on the site (links are on the top left of the site). All of our Headlight & Fog Light Protection kits are available in Clear, HID Blue and GT Yellow along with 3 shades of smoke. The Clear headlight protection kits started it all. A classic clear layer of nearly invisible protection that will help protect your expensive headlights and help keep them from ending up pitted and frosted from all the sand blasting the front of the car is subjected to. The HID Blue Headlight Protection Kits are designed to shine through bright white. The HID Blue covers give non-HID lamps the whiter HID look while protecting your lenses! Great for those with HID’s already too! The GT Yellow headlight Protection are used in various global sports car racing series’ and on GT production based road racing classes in the US to set them apart from other classes. They also simulate the 'French Fog' headlights and provide better visibility in rain, snow and fog - all while protecting them from flying debris. Gives your vehicle the racy I'm coming through look! We also offer three versions of Smoked headlight Protection kits. Our 50% Light Smoke is for those who are looking for a more useful subtle smoked look. The Standard Smoke Headlight Protection kits are as dark as ~30% window tint on our meter. We also have an even darker Stealth Smoke version which allow just ~20% light transmission and look very dark when installed - great for show cars and track cars that are never run at night. 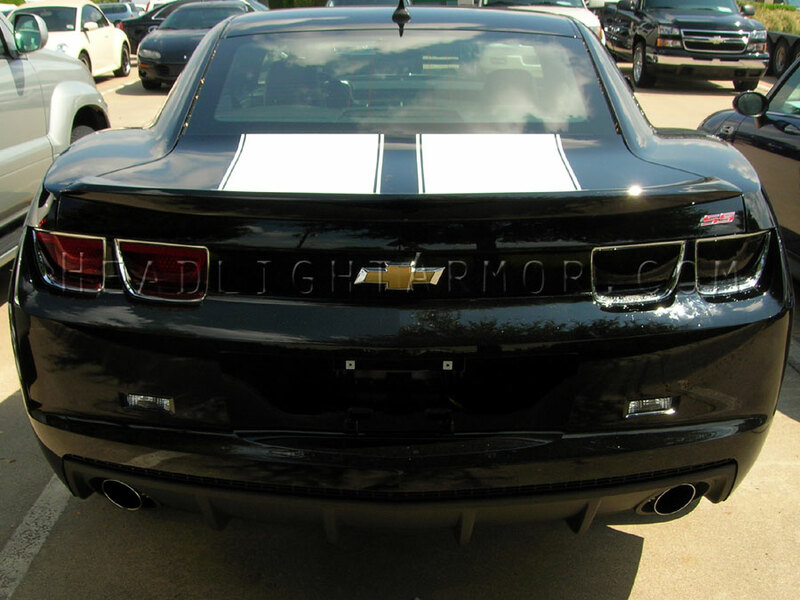 Given the recessed nature of the headlights on the new Camaro all the smoked versions are going to look a little darker in person than on other vehicles. 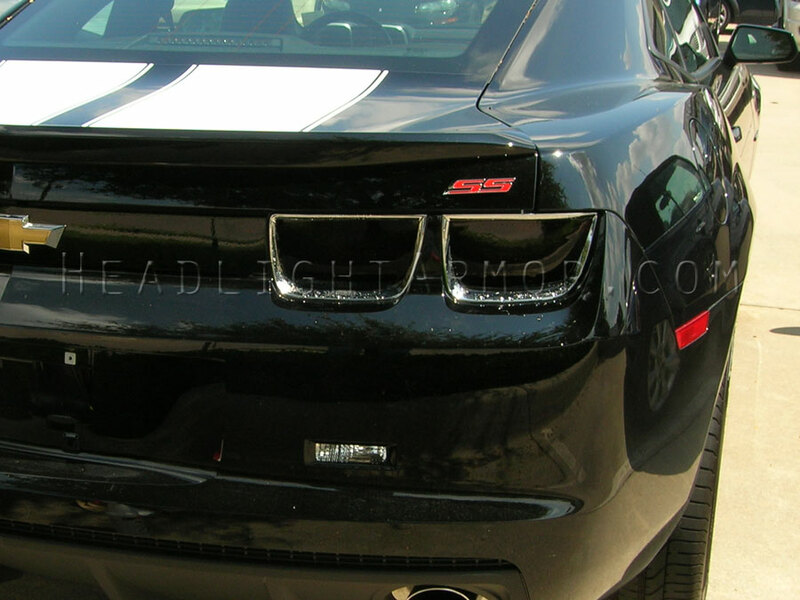 All of our Smoked Taillight kits are available in 3 Shades of smoke. 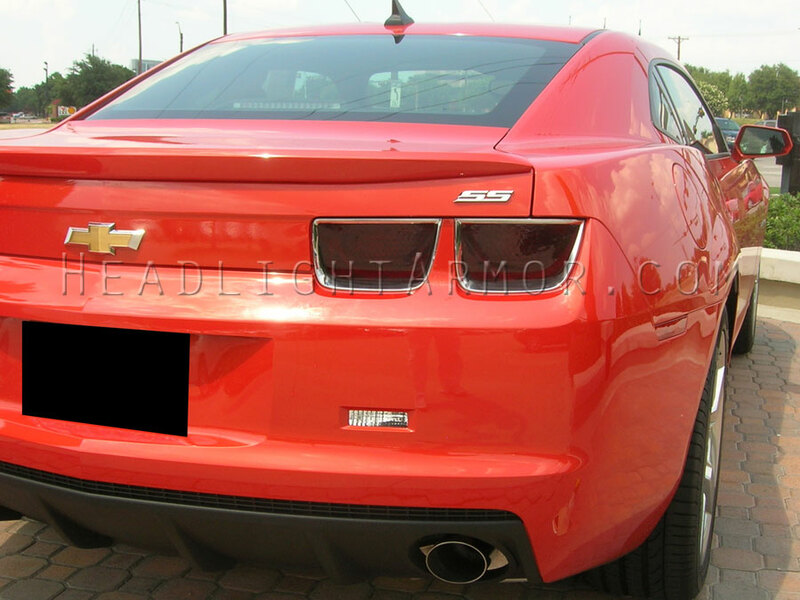 Our Light Smoke taillight Film kits allow ~50% light transmission and give a nice subtle factory smoked look to your taillights. Our Smoke covers allow ~30% light transmission; and look pretty dark when you look at your taillights as most are going over a red/dark red lens. During the day they turn a bright red taillight a rich deep dark burgundy. In lower lighting conditions they look even darker. At night our smoke covers do not have such a large impact; the running lights, reflectors, and brake lights are clearly visible! 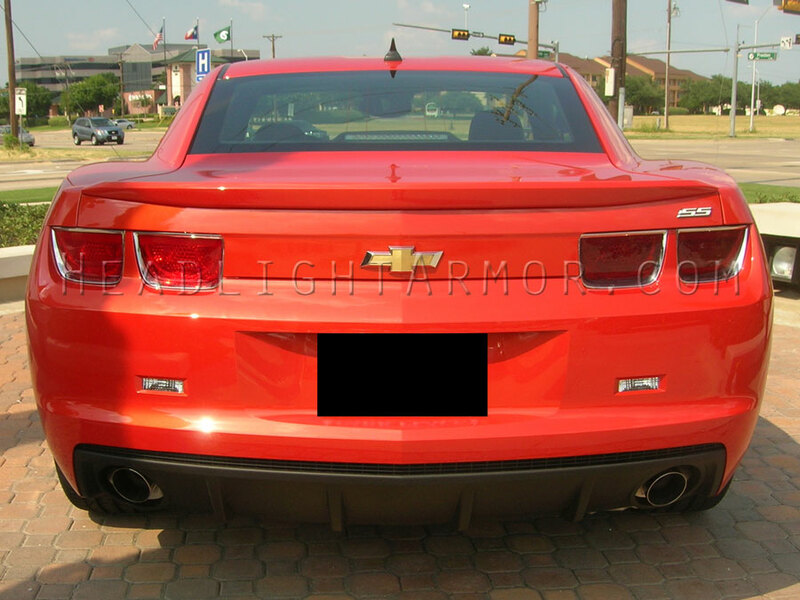 If you were following somebody with the covers installed in a group of 10 different cars you would probably be hard pressed to guess which vehicle had our smoked taillight kit installed. The Stealth Smoke covers allow ~20% light transmission and look very dark when installed - great for show cars! 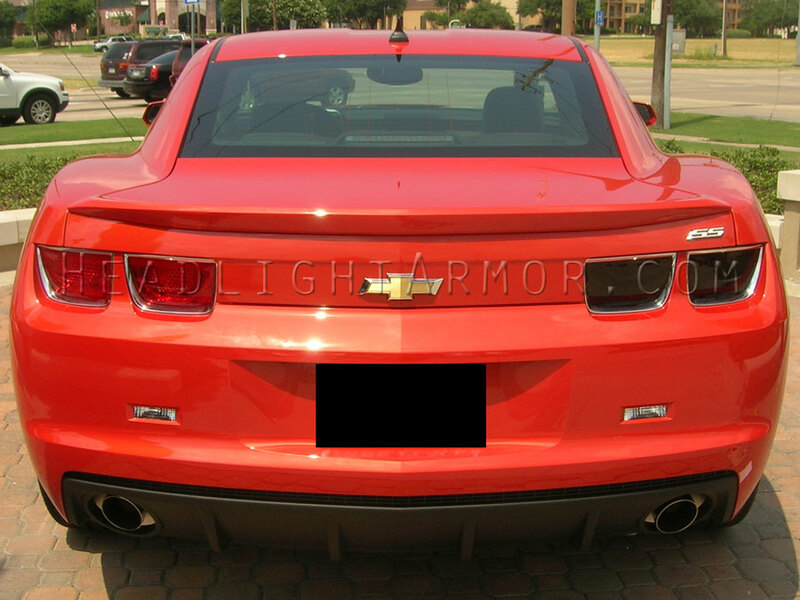 The current Camaro Smoked Taillight kits are designed to be used in conjunction with the factory bezels installed. 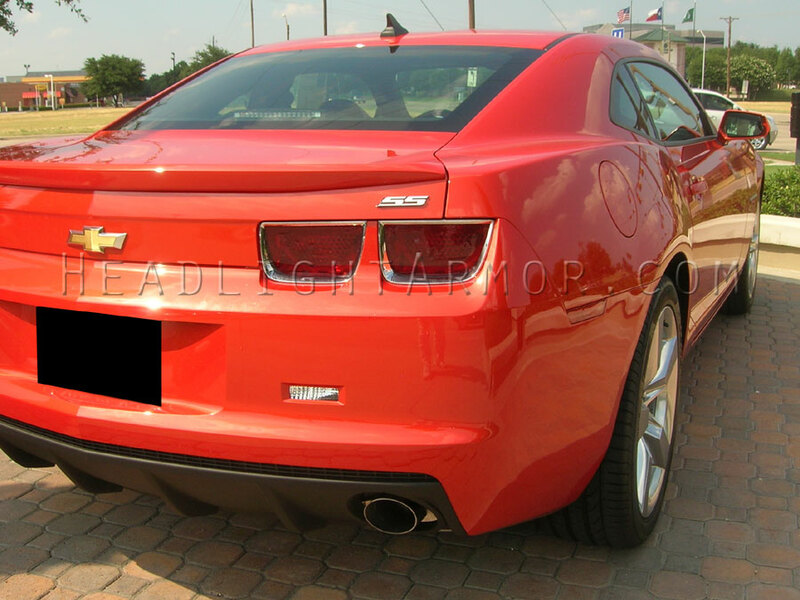 We will be looking for a Camaro that the owner has removed said bezels for further designs. We operate on a mass customization manufacturing to order model. This means that once you place an order on our site it is checked, entered into our production queue and each item is custom manufactured just for you! Under normal circumstances orders place by 2PM CST/CDT are shipped out the same day via USPS Priority or Express Mail. The base rate s/h is the same for all 50 states and US Territories BTW. We also offer free USPS priority Mail shipping to APO / FPO addresses on all orders over $20! Let us know if you have any questions about our products or their application. Thank you for your support! Last edited by HeadlightArmor; 02-23-2010 at 05:14 PM. Last edited by HeadlightArmor; 03-12-2010 at 08:16 AM. Last edited by HeadlightArmor; 02-23-2010 at 05:15 PM. How does dark stealth smoke look on black?? 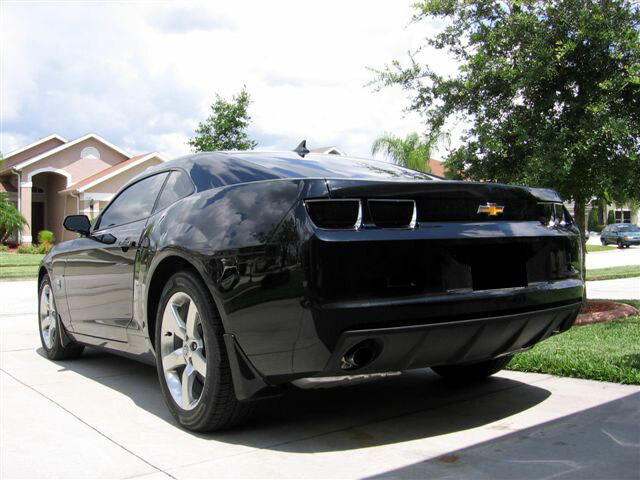 Here is a shot of out Stealth Smoke Taillights & Side Markers a customer sent in. We should have additional photos of all three shades on an RS option car today. Given that the RS Taillights are darker to begin with each tint level looks a little darker than on the standard taillights. Just want to add, if this is the place to do it, that I ordered these last friday, and I got them Monday, priority mail, with free shipping....had them installed today...didnt want to risk doing it myself...and they are awesome!!!!!!!!!!!!!!!!! I highly recommend them....and headlight armor guys, I had car stereo plus in Sumter, SC do the install, and they seemed like they really liked the product and wrote down your website. Great to hear! We work hard at not only providing great kits but at processing the orders as quickly as possible too. If you have some pic's post them if you have a chance, we love seeing the finished product! On a side note. All of our lighting kits are really aimed at the DIY installer as opposed to having a shop do them. Some vehicles do take some additional time, but thankfully the Camaro kits are all pretty straight forward. It did look kinda easy to install, I could have done the side markers with no problems, but I didnt want to risk it. 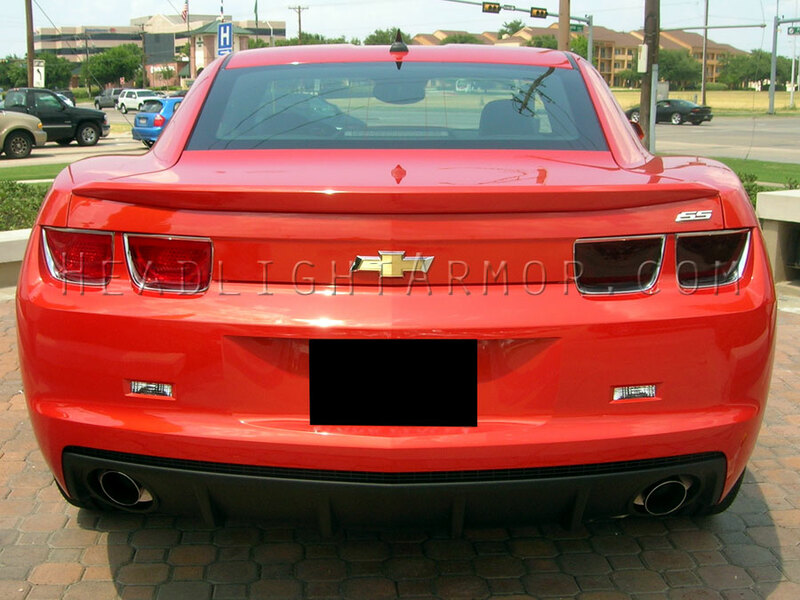 do the tail lights require to remove the bezels to install? 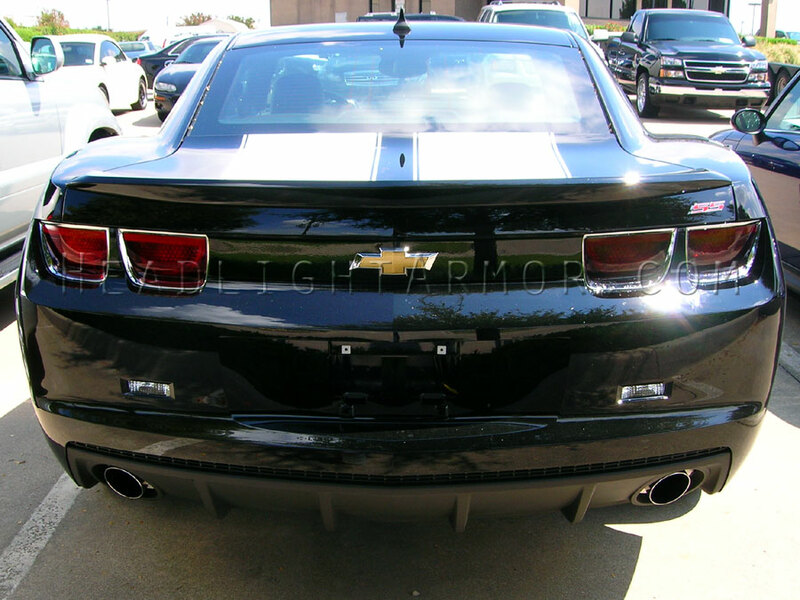 Our smoked taillight kits are designed to be installed with the bezels in place. how good r the brake lights after install are they considerably dimmer after the stealth black? The materials have less of an effect on light output in a taillight application than they do in a headlight application. 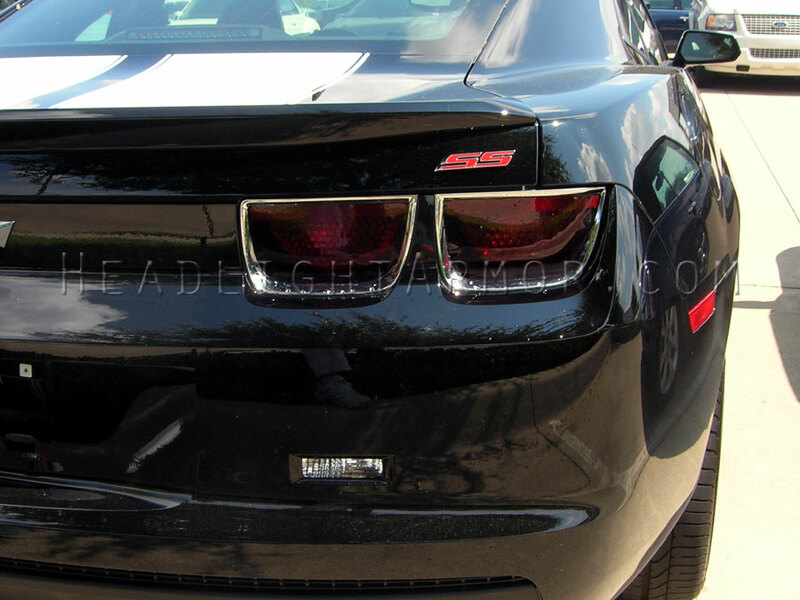 We have a few shots of the brake lights in our smoked taillight gallery here. 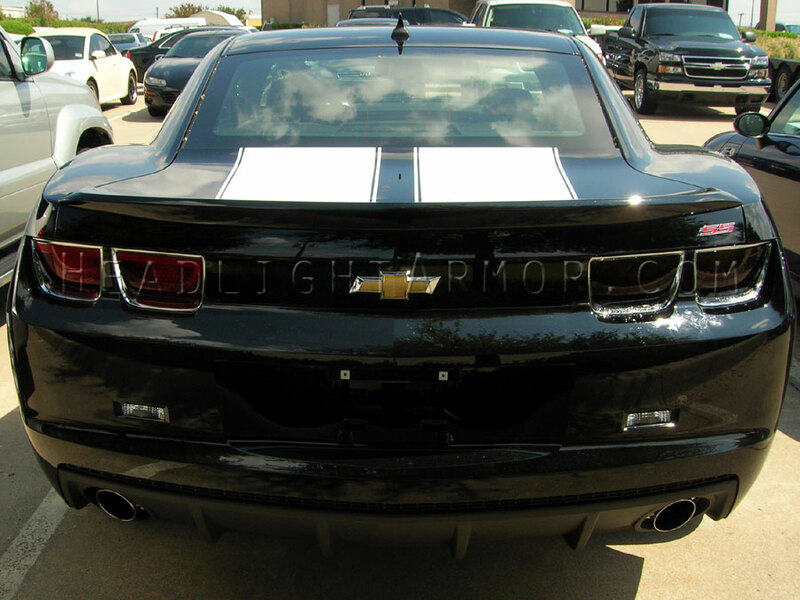 including these two (Dark Stealth Smoke non-LED taillights. We have sent a variety of Camaro kits out over the past few months so maybe there are some members here with other (night) shots.